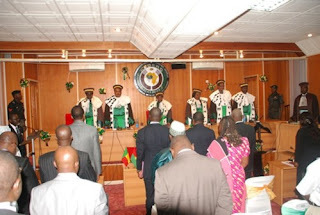 ABUJA - The ECOWAS Community Court of Justice, sitting in Abuja, has for the umpteenth time adjourned ruling into the fundamental enforcement rights suit filed against the Nigerian government by the leader of the Indigenous People of Biafra, IPOB, Nnamdi Kanu. The suit filed since March 2016, has suffered series of setbacks owing to numerous postponements, absenteeism, flimsy excuses and application of fresh motions by the respondent. Recall that the case was hitherto adjourned in November 21, 2017, after a previous postponement a month before that time, following the absence of FG's Solicitor General and further applications filed by it in the matter. However, during its resumed hearing on Tuesday, the regional court presided over by Justice Hemeye Mahdmadane, again announced its decision to make further adjournment after entertaining a fresh application by the respondent. According to Mahdmadane, the court’s decision to adjourn the matter is based on the fact that motions brought before the court in November were yet to be translated into English language by the court staff. In his counter motion, lawyer to the IPOB leader, Ifeanyi Ejiofor, who alleged biasness and partiality over the conduct of the court, threatened to withdraw the suit and seek justice elsewhere, if they continue to adjourn the hearing on the matter. Ejiofor who expressed dissatisfaction over the new application by the respondent, further argued that at the last session, the presiding judge had promised never to entertain anymore adjournments over trivial issues. Meanwhile, at the opening session, counsel to the respondent, Ms. Maimuna Shiru, informed the court that their decision to file a fresh application was to notify the court of “a recent development in the matter,” adding that IPOB had been proscribed by the federal government and that a Federal High Court sitting in Abuja, affirmed it. But reacting to the respondent’s application, Ejiofor accused the FG of frustrating the hearing of the matter through their incessant applications. The presiding judge, however, adjourned the matter to May 30, 2018, after taking their submissions. Speaking to our Correspondent shortly after the hearing, Barrister Ejiofor stated that the continued adjournment in the matter would further malign the integrity of the regional court. “This matter came up on 21st November 2017 and it was adjourned to 7th February 2018 for its hearing. Today in court, l was told they filed an application for additional evidence. But that is not why the matter was adjourned. The court said that the motion filed last year November by the federal government, has not been translated in a language the judge understands which is due to administrative lapses on the side of the Nigerian judiciary and so he adjourned the matter to 30th May 2018. “I have told them that adjourning this matter today, will suggest to a layman who is participating in this proceeding that is not impartial and which will indirectly, impugn the integrity of this court. This matter has suffered several adjournments at the expense of the applicant and this is a fundamental application which supposed to be heard speedily. “Adjourning this case has been giving the respondent the opportunity to be filing all forms of processes. On account of what that has been transpiring in Nigerian courts, they will keep on filing processes, if a ruling is delivered at the Federal High Court yesterday, they will come and file a fresh application today and that has been affecting the speedy hearing of this matter. “So, for the fact that the department which is supposed to deal with the translation of the process file didn’t do their work, will be accepted and eventually, adjourned the matter to 30th May 2018.